April 14, 1980 - Iron Maiden: Iron Maiden is released. In a time when many were predicting the demise of heavy metal, 1980 proved to be a banner year for the genre. Black Sabbath and AC/DC both made triumphant returns with new lead singers. Black Sabbath had split with Ozzy Osbourne and brought in former Rainbow lead singer Ronnie James Dio and released their classic "Heaven and Hell" album. AC/DC had the tough task of replacing Bon Scott, who had passed away in February of 1980 but by July they returned with the biggest album of their career, "Back In Black." Also in 1980 Ozzy Osbourne released his debut solo album and Judas Priest made their commercial breakthrough with "British Steel." Although these heavy metal veterans were making great strides in keeping the metal flag flying, there was new breed of heavy metal bands coming out of England that would inject new life into the scene and pave the way for what would be metal's biggest decade. This movement in the UK was dubbed the "New Wave of British Heavy Metal" by writer Geoff Barton for the first time in the May 1979 issue of Sounds magazine and was a way to describe this second wave of British metal music that was taking shape. Leading the way in the NWOBHM were Saxon, Motorhead, Def Leppard, Diamond Head, Girlschool and Iron Maiden. Iron Maiden was formed in 1975 by bassist and chief songwriter Steve Harris. but it would take a few years of trial and error before Harris would find the right combination of players for Iron Maiden. The band recorded their first demos on December 31st, 1978 and would eventually release these tracks as "The Soundhouse Tapes" in November of 1979 on their own label. "The Soundhouse Tapes" quickly sold 5,000 copies and the band secured a recording contract with EMI in December 1979. The band attempted to record their debut album in December of 1979 with a couple different producers, but the sessions proved to be unsuccessful and the band went on tour. In January 1980 a third attempt was made to complete the record and with producer Wil Malone on board they finished the album in just 13 days. The album was released on April 14th, 1980 and received rave reviews from the British press and was a big hit on the UK charts. The sound of the album is very aggressive & raw and at times sounds almost punk..Steve Harris has commented that the band hated everything about punk rock music and that their music had nothing in common with the punk rock scene that had become very popular in England at the time. Listening to the album, it's hard to deny that punk had an impact on the energy and overall attitude of Maiden and the new wave of metal. Early favorites such as "Prowler," "Phantom of the Opera," "Charlotte the Harlot," "Transylvania" and "Remember Tomorrow" are included as well as the title track "Iron Maiden." 'Running Free" was released as the first single from the album and the band made an appearance on Top of the Pops. Maiden refused to lip-sync their performance on Top of the Pops and became the first band since The Who in 1972 to perform live on the show. The U.S. version of the album featured "Sanctuary," a track not included on the original UK release. 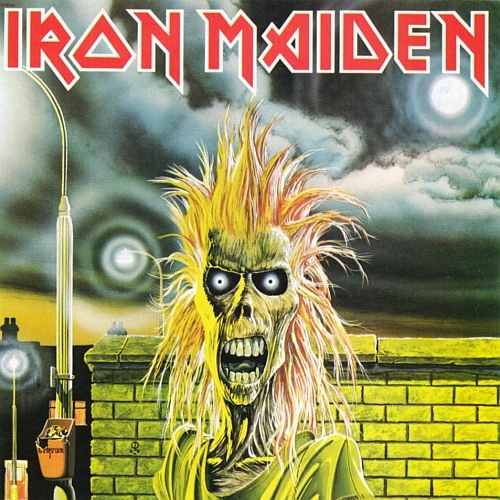 Iron Maiden released three singles in 1980: "Running Free," "Sanctuary," and "Women in Uniform," all of which featured cover art by Derek Riggs, who also designed the cover for the first album, which featured the bands iconic mascot "Eddie." Riggs would work with the band into the 90's on most of their album & single covers and his artwork became almost as iconic as the bands' music. The line up for this album included singer Paul Di'Anno, drummer Clive Burr, guitarists Dave Murray and Dennis Stratton and of course bassist Steve Harris. The band toured in support of the album opening for KISS on the European leg of their "Unmasked" tour and shortly thereafter guitarist Dennis Stratton was fired and Adrian Smith was brought in as his replacement. The band would record one more record with singer Paul Di'Anno - 1981's "Killers" - and then he would be replaced by former Samson vocalist Bruce Dickinson. With Dickinson in place the band became a huge international success with the release of their third studio album, "The Number of the Beast." One more line-up change came when Clive Burr was replaced by Trust drummer Niko McBrain: this would become the most stable and successful line up in the bands history. Thirty-five years on Iron Maiden remains one of the most successful metal bands in the world, selling out huge stadiums all around the globe and releasing new albums every few years. Maiden's first record is still a fan favorite and the band closes most shows with it's title song and a song that bares their name, "Iron Maiden". Scott Carr is a guitarist who plays in the Columbus, OH bands Radio Tramps and Returning April. Scott is also an avid collector of vinyl records and works at Lost Weekend Records. So...if you are looking for Scott....you'll either find him in a dimly lit bar playing his guitar or in a record store digging for the holy grail. A page from Iron Maiden's 1981 "Killers" tour book documenting their tour with KISS in 1980.